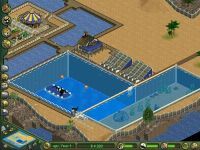 Zoo Tycoon: Marine Mania is an expansion pack for Zoo Tycoon, which included aquatic animals and themed buildings. Players could create and manage underwater exhibits or merge aquatic tanks with traditional land habitats. Interactive tutorials and virtual marine specialists were available to help players maintain animal happiness. In addition, 10 new scenarios were added. Source: Wikipedia, Zoo Tycoon: Marine Mania , available under the CC-BY-SA License.